But when it comes to tying it all up with a solid conclusion, I’d argue that many of us aren’t giving that component the thought and care it deserves. In today’s crowded content landscape and increasing numbness to marketing messages, we can’t afford to leave any opportunity for engagement, connection, and conversions on the table. So for me, conclusions shouldn’t be an afterthought, but rather an essential marketing storytelling element for three main reasons—which is something I detail in this little video shoot I did with TopRank Marketing President Susan Misukanis. Take a peek at my video debut if you want the Cliff’s Notes, but I encourage you to keep reading to get more depth and examples that can inspire the next piece you craft. #1 – Content consumption is bite-sized. First of all, it’s no secret that humans have short attention spans. How short? Roughly 8 seconds. And in an age of so much content at our fingertips, so much content that is ready to be consumed—it’s overwhelming. As a result—whether we’re curious about a new trend, researching something we may need to purchase, professional development—we often scan or skim content to get satisfy our need for credible, quality content in the shortest amount of time. All that said, there are absolutely moments when we’re willing to commit to diving deeper and give something our full attention—which brings me to my next point. #2 – If we’ve done our jobs and we’ve enticed a reader to the end, we absolutely want to leave them with something of value. Keeping folks on-page and encouraging them to interact with the content. The easiest example here is asking a thought-provoking question that relates to the topic and gives readers a chance to lend their voice. 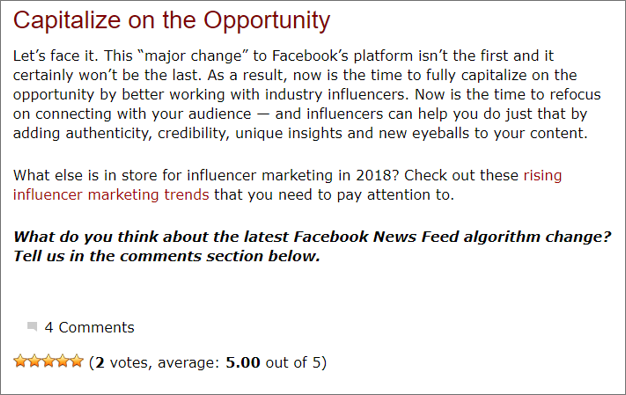 Here’s an example from my recent post regarding Facebook’s latest algorithm changes and what they meant for influencer marketing. As you can read, there’s a summary, actionable next steps from a takeaway and other reading standpoint, and then a related question to encourage discussion. Appealing to your reader’s emotions by leaving them with a little food for thought, inspiration or encouragement is a great way to reinforce every word up until that point and create a more personal connection. From my perspective, this route is especially great for thought leadership pieces. In my journalism days, one of my go-to tactics here was to end with a compelling quote from one of my sources. I’d bring it all back together and then frost it with an interesting, uplifting, or sometimes a little heart-wrenching quote to really drive it home. Here’s a subtle example from the *LinkedIn Marketing Solutions Blog. Titled Play Ball! 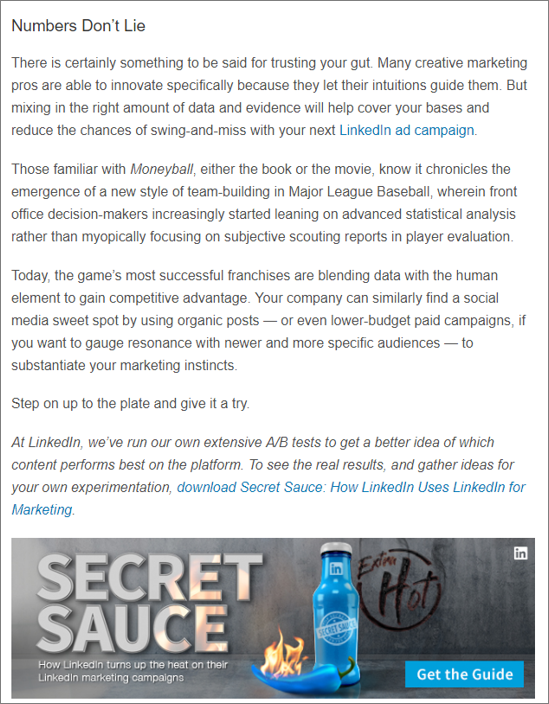 How Marketers Can Apply the Principles of Spring Training and Experimentation, this baseball-themed post discusses how marketers can use spring training as inspiration for validating and optimizing social ad campaigns. With baseball season kicking off, the metaphor itself has a great hook for appealing to their audience’s interests. When it comes to the conclusion, the minimum best practices of circling back and providing a summary are in play. And it’s done with the inspirational, “you can do it” sentiment woven throughout. Then the final line—”Step on up to the plate and give it a try”—gives readers “permission” to try a little something new. Of course, there’s a related CTA, too. This one is simple and probably one of the most widely used. This is all about giving readers something to do next. You’ve addressed a pain point or issue, you’ve offered insights and some solutions, but now the question is: What do they do next? I want to be careful to say that this isn’t just a simple call to action. The conclusion should absolutely lead them to believe that the end CTA is worth their time. Here’s a lovely example from TopRank Marketing’s Anne Leuman. Her recent post on search marketing integration, which featured a philosophical theme, she reinforces her main point and highlights key benefits. When it comes time to deliver the next step, she uses a “but wait there’s more” approach that tells the reader they have more integration possibilities to discover. These three plays don’t stand alone. They can be played with and combined to fit your topic, audience, and natural next steps for readers. 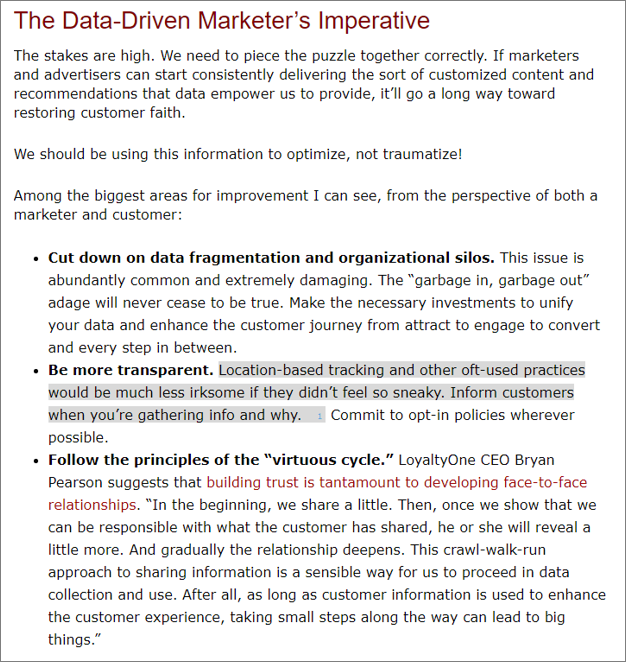 In our own Nick Nelson recent post In a World of Diminishing Trust, Data-Driven Marketers Can Turn the Tide, Nick tackles consumer mistrust and what that means for marketers moving forward. He begins with data-mishap story, outlines the trust issue, talks about the solution, and then it’s time for the conclusion where he artfully leverages a combination of the plays above. His first few paragraphs tug at the emotional and inspirational heartstrings, but also delivers tactical value with next steps and takeaways. Finally, the related CTA isn’t just a simple “Read more” line. #3 – Every great story has a great ending. Last, and certainly not least—and although it may sound a little hokey: Every great story has a great ending. No actually, every great story deserves a great ending. Period. We marketing writers are dedicated to our craft, spending hours to develop click-worthy headlines, compelling hooks and valuable body copy. But let’s not forget that every great story needs to have a great ending. At a minimum, you should be circling back to your main points to give your audience a thoughtful summary and then providing them with a next step. And depending on your industry, topic, audience, and stage in the funnel, you should blend tactics to leave readers with something of value—whether that be inspiration, food for thought, actionable nexts steps or takeaways, or a little mix of everything. Looking for ways to up your writing productivity, while also delivering on quality? 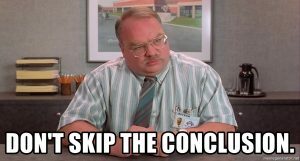 Getting started can be the hardest part, so why not start with your conclusion? Get more content productivity hacks to help you take creation from failing to flying high. What are your thoughts on the importance of conclusions? Do you agree with me? Disagree? Share your thoughts on the subject. 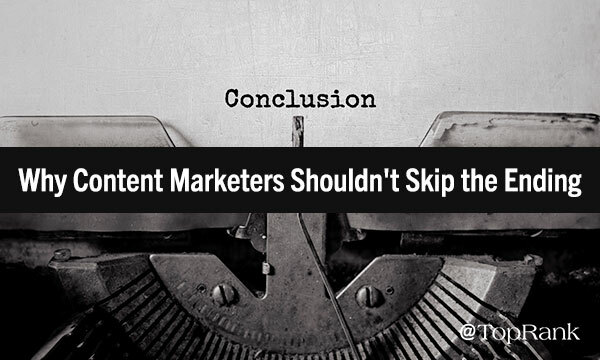 The post Crushing Conclusions: Why Content Marketers Shouldn’t Skip the Ending appeared first on Online Marketing Blog – TopRank®.